LG Electronics USA is taking its “Life’s Good” mantra to the four-day 2018 Bonnaroo Music & Arts Festival this month, staging an interactive destination to showcase come of its products. Between June 7 and 10, LG will be online with a 3,600-square-foot destination located in the heart of the 700-acre outdoor camping festival. The space features a number of interactive experiences. 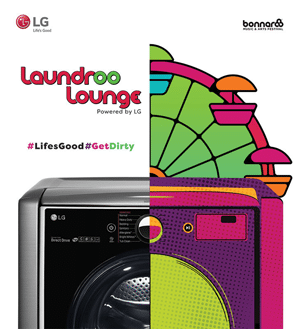 The LG LaundROO Lounge will feature 25 washing machines and 25 dryers as well as LG Styler steam clothing care systems; festival attendees camping on site can drop off their clothing for a complimentary wash’n’fold experience before returning to the dance floor. Users can share the experience through the #GetDirty hashtag. Then there is the Vintage Clothing Swap. LG has tapped the expertise of much-beloved vintage shop What Goes Around Comes Around to source 2,500 pieces of clothing for a unique onsite swap. Festival goers are encouraged to visit with stylists at the LaundROO Lounge to choose a look from the LG closet that best captures their festival identity. Visitors will swap out their own clothing, which will then be washed in LG washing machines and dryers before going on the rack for other festival goers to peruse, ensuring a constantly replenished and fresh selection of items. Remaining clothing will be cleaned and donated to a local charitable partner at the end of the festival.